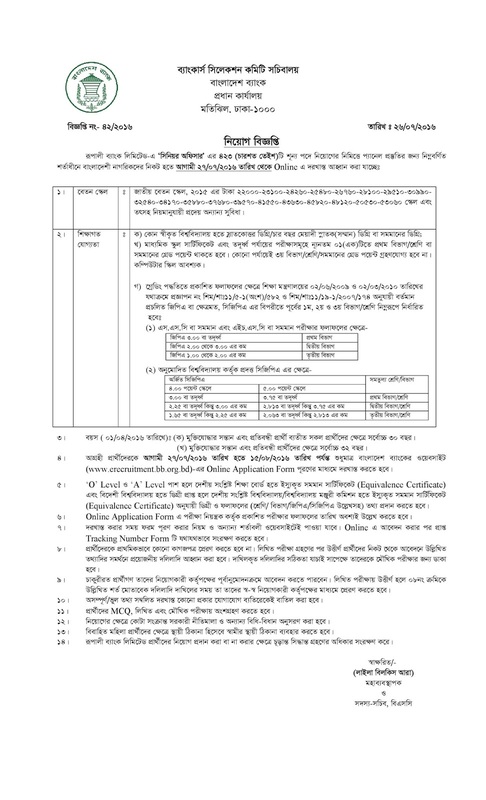 Rupali Bank Senior Officer Job Circular 423 Post 2016. Rupali Bank Limited will recruit 423 personnel for the post of Senior Officer. Rupali Bank Sr Officer online apply has started on 27 July to 15 August 2016. Candidate should submit application via Bangladesh Bank website only www.bb.org.bd or https://erecruitment.bb.org.bd. As you all the Government Bank jobs recruitment controlled by Bangladesh Bank only. So this Rupali Bank Sr officer recruitment also will be by Bangladesh Bank Selection Committee Secretariat (BSCS). If you are the right person for the post then do not delay to apply. Log in BB website and fill your application. After completed the online application, Bank authority and Bangladesh Bank will publish the MCQ exam date and time. before 2 or 3 days they also publish the seat plan. So candidate have to download their seat plan on this site. We requested to all the candidates who will apply Rupali Bank Limited jobs for Senior post, Please visit this site frequently this site for further information. Here you can get your all thing about this Sr Officer Jobs as well.